The Samsung Galaxy Note 7 is set to be packed full of features, both new, like an iris scanner, and old, like an always-on display, but one thing Samsung's been resistant to stick in its phones so far is a USB Type-C port. It even went as far as to tell us earlier this year that the market isn't ready yet, as everyone is so heavily invested in micro USB. It's a fair point, but one which Samsung might be rethinking already, as a leaked video and images from Vietnamese site Tinhte.vn show a Samsung-branded USB-C cable, with the model number EP-DN930CWE on the packaging. It's the middle part of that which is important, as the Samsung Galaxy Note 7 is expected to have the model number SM-N930, so this cable could well be designed for it. 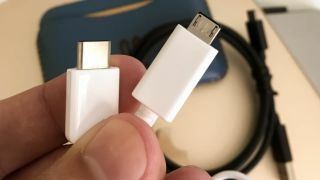 The cables or the branding could of course be fake, especially given Samsung's solid reasons for not wanting to go down the USB-C route yet. As well as arguing that the market wasn't ready it also explained to us that one of the biggest benefits of USB-C is already offered by its phones, namely fast charging. That only really leaves the reversible nature of USB-C cables as a big reason to switch and with Samsung making a big push to be a major VR platform with Gear VR it wants its micro USB headset to be compatible with future phones. But that last point leads to our only other hint that Samsung could be switching to USB-C, as a couple of weeks ago a listing for a new Gear VR popped up on an import database. The most obvious reason for a new model? A new connection. So while there's no guarantee of USB Type-C in the Samsung Galaxy Note 7 it's looking quite likely. Whether the market is now ready for it remains to be seen, but with Apple likely dumping the 3.5mm headphone port for the iPhone 7 this could be the least of our port woes.